JANET GAYNOR in "Seventh Heaven", "Street Angel", and "Sunrise", Louise Dresser in "A Ship Comes In", Gloria Swanson in "Sadie Thompson"
FRANK BORZAGE for "Seventh Heaven", Herbert Brenon for "Sorrell and Son", King Vidor for "The Crowd"
The original AMPAS (International Academy of Motion Picture Arts and Sciences - 'International' was soon dropped from the title) had only 36 members when the Academy was founded, at a dinner at Los Angeles' Ambassador Hotel on January 11, 1927. On May 11, 1927, a week after the state granted the Academy a charter as a non-profit organization, an official organizational banquet was held at the Biltmore Hotel. Of the 300 guests, 230 joined the Academy, each paying a $100 fee to join. The first awards ceremony/banquet, a black-tie dinner, was held in Hollywood (at the Roosevelt Hotel) on May 16, 1929 with guest tickets costing $5, to honor films made from the beginning of August 1927 to the end of July, 1928. There was no suspense to the announcement of winners in the five-minute ceremony - they had been named three months earlier. This first awards ceremony was the only time in Academy history that the event wasn't broadcast in some way. One winner, and two runners-up were named in each category. In the first year of the awards, the term "Honorable Mention" was used in place of the term "Nominee." (However, the term nominee will be used in this summary.) Fifteen statuettes were awarded, all to men except for Janet Gaynor who won for Best Actress. For this year only, the Academy gave awards for multiple, rather than single achievements. 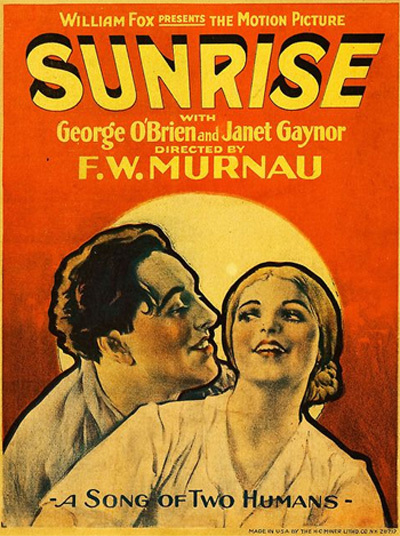 The Academy Awards were born the same year that sound was born, and Warner Bros.' The Jazz Singer was honored with a Special Award (and only one nomination for Best Writing - Adaptation for Alfred Cohn) as the "pioneering outstanding talking picture, which has revolutionized the industry." The Academy ruled that The Jazz Singer was ineligible for competition for the Best Picture award, because it was thought that it would be unfair to let sound films compete with silents. Originally, the Academy planned to grant two 'Best Picture' (or Best Production) awards - and it did so in its first year. one for the "most outstanding motion picture production"
one for the "most unique, artistic, worthy and original production"
Four of the five nominated films for Best Picture (all except The Racket) were from Paramount Pictures studios. 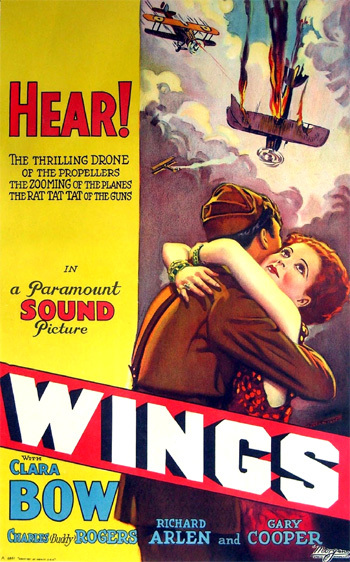 The silent classic war film filmed in widescreen Magnascope, director William Wellman's and Paramount's Wings, was the official first winner of the Best Picture award as the "most outstanding motion picture production." The most expensive film of its time (at $2 million), it featured spectacular aerial footage (air battles, bombing raids and crashes) and state of the art visual effects in its story of two flying buddies who accidentally shot each other down. 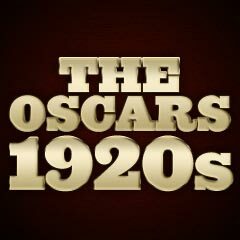 To provide continuity, the Academy now lists Wings as the "official" Best Picture of the first awards. That makes Wings the only silent picture to have won the Best Picture award. Frank Borzage won his first of two Best Director awards for his Seventh Heaven. King Vidor lost as Best Director for The Crowd, one of the greatest silent films ever made - about the day-to-day problems of a working-class family during the Jazz Age in the big city. The directors of the two 'Best Pictures,' Murnau and Wellman, were both denied a Best Director nomination. [There are only two other 'Best Picture' winners whose directors were not nominated for Best Director: Grand Hotel (1931/32) and Driving Miss Daisy (1989).] The category of Best Comedy Direction was discontinued after the first year's ceremony. Its winner was Lewis Milestone for Two Arabian Nights. The only other nominee in the category was Ted Wilde for Speedy. Up until the 1950 Academy Awards ceremony, the Academy's Honorary Awards were called Special Awards. Mary Pickford was not nominated in the Best Actress category (but could have been if she had been interested) for her role in My Best Girl. Director/star Buster Keaton's (known as "The Great Stone Face") classic silent film The General was not nominated - a major snub - in which Keaton portrayed Civil War-era, Southern Confederate train engineer Johnnie Gray (who was passionately in love with his train The General). Nor was King Vidor's The Crowd nominated for Best Picture (but it was nominated in a short-lived, one year long category known as Unique and Artistic Picture). Director William Wellman, who was responsible for the excitement of the flying sequences of 'Best Picture'-winner Wings, was overlooked in the nominees. Janet Gaynor's co-star in Seventh Heaven was unjustly ignored. Al Jolson was not nominated for his role as Jakie Rabinowitz in The Jazz Singer.